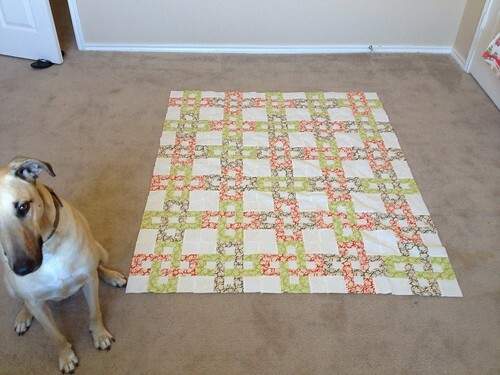 So I am almost done with the Chain Link quilt top. I have finished the center of it and am in the process of putting borders on. This is what I decided on for the border. I wanted to keep it simple to go along with the style of the quilt. It will finish about a twin size I think. 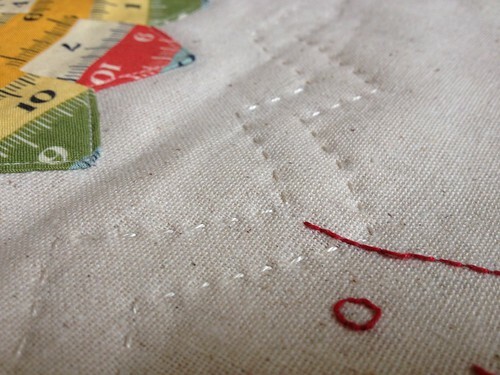 I should be able to finish this top tomorrow and possibly even quilt it as well... Hmmm. But I also have another finish I'm pretty happy about! MY NAME GAME SWAP MINI! It should arrive in El Paso to it's owner today so I can show you what it looks like finally!! My partner is Irene from Hilachas. 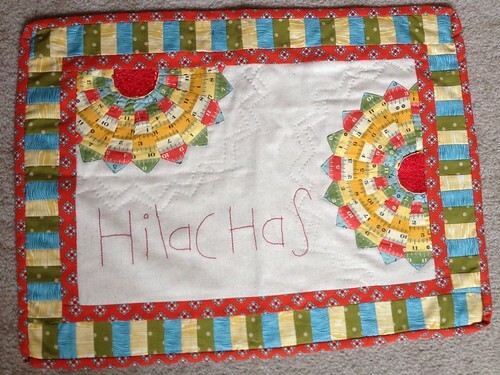 Hilachas is Spanish for the loose threads all over the floor in your sewing room. I wish we had an English word for those! To ties in the loose threads I cut up pieces of red pearl cotton and FMQ'ed them down into the center of the dresdens to give texture and truly tie the meaning of her name into the piece. 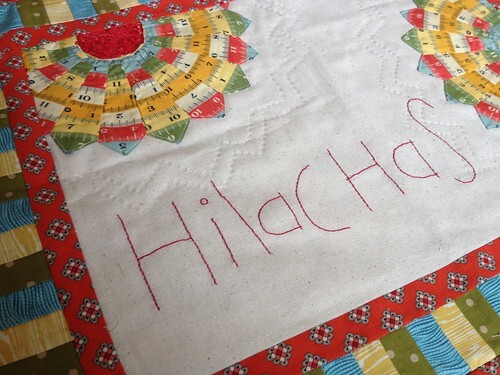 I hand quilted the echo from the dresden plate. I'm very happy with how it turned out, I was a little worried at first because her style was much more traditional than mine but I think I was able to combine both our styles with a nice result! 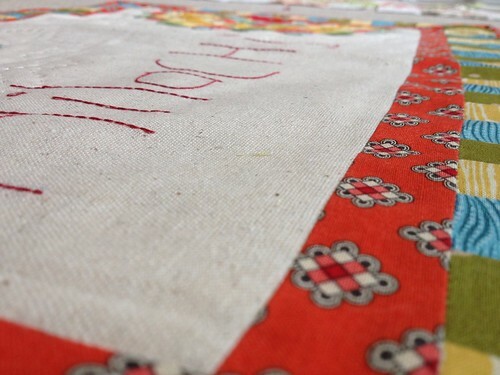 Dropping by through Crazy Mom Quilts...what great projects. 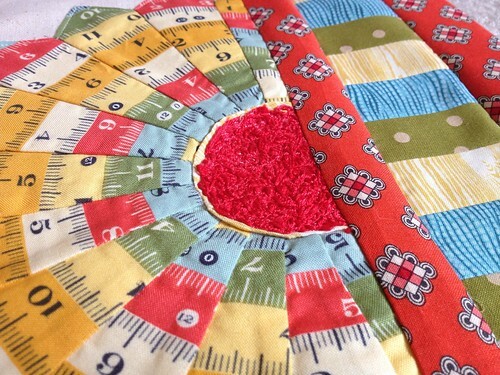 I love the tape measure fabric you used for the swap quilt. Adorable! 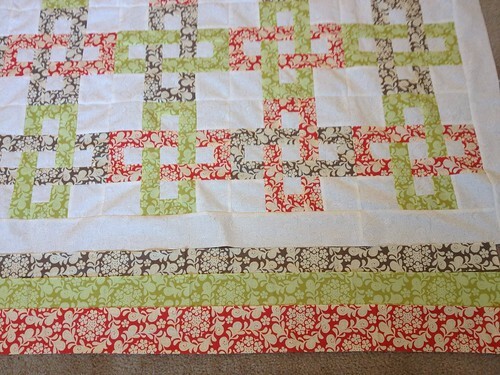 The Chain Link quilt is wonderful and the mini is darling! 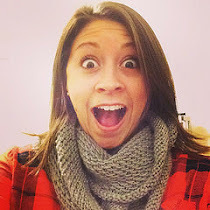 I have a Little Quilt Monday link up and you are welcome to link up your swap mini quilt there : ) Dresden's are on my list of want to dos! Love. IT. Those dresdens are perfect!! And the quilt top is awesome!! Well done! I'm sure your partner will love the mini! Very cute! O que é isso??? ?Mais lindo que isso só dois disso.Como é feito? Que tecido é esse?Este seu post está com fotos maravilhosas,mas as letras totalmente nublada,não deu pra ler nada.Beijo.Vou te seguir. I call it thread scumble! Love the texture you created, brilliant idea.